Now through Saturday. April 25, 2015 if you have an Chase Ink Plus, Ink Bold or Ink Cash card you can pick up an easy 2000 Ultimate Rewards points! 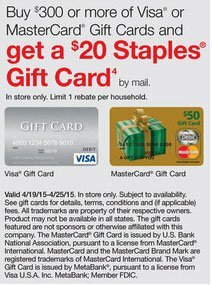 Staples is having a special where if you buy $300 of either their MasterCard or Visa gift cards, they will via easy rebate (this means it is all online and not a mail in rebate) send you a $20 Staples Gift card by mail. Author John ButlerPosted on December 15, 2014 December 20, 2014 Categories Chase Ink Bold, Chase Ink Plus, Chase Ultimate Rewards, Manufactured SpendLeave a comment on Get 24,000 Free Ultimate Rewards Points from OfficeMax! Get paid $13 for earning 400 miles with Amex and Best Buy! Don’t forget to enter our TravelWithMiles Guru contest that ends Friday. A free plane ticket to Cancun is guaranteed but maybe even more! I’ve talked about Amex Sync offers in the past and have made money and miles with them several times. I even recently gave away one of the CPK gift cards that I received with a Sync offer to a lucky Facebook reader. Best Buy has a current Amex Sync offer for $25 back with a $250 purchase. It is super easy to get. You can register for the promotions within Amex online account (where you pay your bill online), or via Facebook, or via FourSquare, or Via Twitter. I prefer using Twitter because it is fast and I get an instant tweet back confirming my sign up. I don’t really use Twitter but set up an account just for promotions like this. 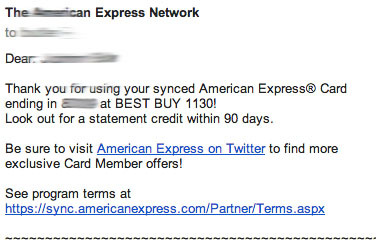 If you haven’t linked your Amex Card to the Sync Program yet then Click on this link and then Click on Sign in with Twitter. 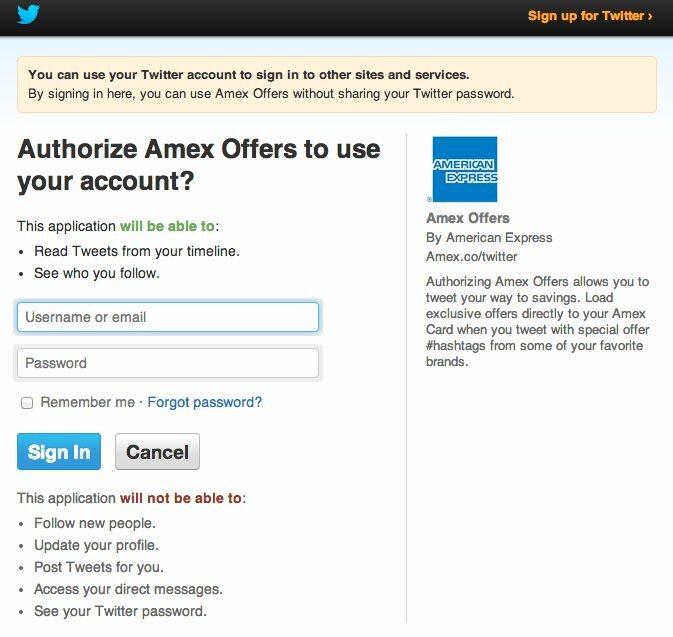 It will then pop up an authorization screen where it lets you connect your twitter account to your Amex Sync account. Just put in your Twitter login information here (notice the site is on Twitter.com so you aren’t giving your login info away to some third party site). Don’t worry if this sounds complicated. It’s not! 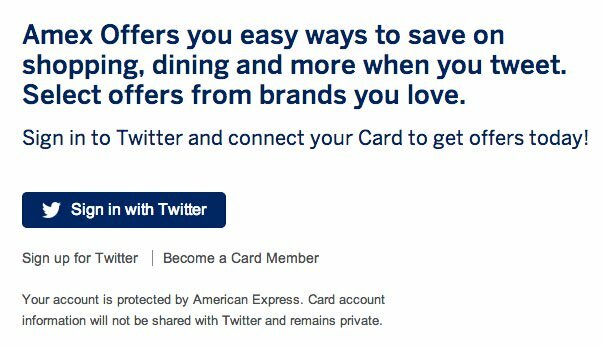 Once you get logged in you link your Amex card to your twitter account. Once all that is done, you just Tweet #AmexBestBuy and you should get a tweet back as well as an email confirming your signup (or letting you know if there is a problem like they have reached capacity, which happens sometimes). If you want to use Facebook or Foursquare then follow the directions at this page, but I find Twitter to be the quickest. Keep in mind if you have multiple Amex cards, you can sync each one with a different method and get multiple sync bonuses. At that point you are ready for Step 2. I didn’t need any electronics right now so I decided to go with my favorite thing to buy, gift cards! 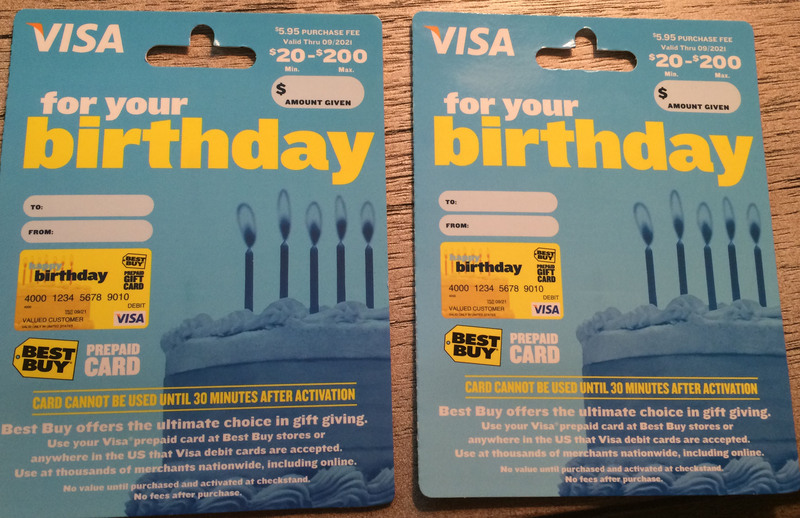 They mainly have Best Buy gift cards, but if you look carefully in the same section, they also have Best Buy branded VISA gift cards. Score! They look like this. I bought two of them for $205.95 each for a total of $411.90. At the cashier I had the cashier put $250 on my Starwood Preferred Guest® Business Credit Card from American Express, and then the balance on my US Airways® Premier World MasterCard® (I am trying to build up my US Airways miles so I have enough for a fun trip). So total I will receive 250 SPG points and 162 US Airways miles. I will have paid $411.90 and receive a $25 credit back, for a net profit of $13.10. Which brings us to the easy part, step 3. This part happens really quickly. More or less immediately after you make the charge, you should get an email thanking you for using your synced card at Best Buy. The credit should post to your account within one or two days even though it says it can take up to 90. Now that you have $400 in Visa gift cards, what to do with them? You have several different options. Of course you can just spend them for day to day expenses. Or you can load them onto your Bluebird card and use them to Pay your rent or Mortgage. Or you can even get money orders for them from Walmart or Kroger! So many options and all of them are great! You will need to set the PIN on these Metabank VISA cards before you can use them for this by calling 1-888-524-1283. I know it doesn’t seem like this is a huge deal. And it isn’t. But if you look back at all of the Manufactured Spend posts we have made over the last few weeks, you will see that they really add up over time to a decent chunk of miles! Author John ButlerPosted on July 23, 2014 July 23, 2014 Categories American Express Sync, Amex Business Gold Card, Manufactured Spend, SPG Business AmexLeave a comment on Get paid $13 for earning 400 miles with Amex and Best Buy! I have been buying money orders at Walmart with gift cards for a while now to earn free miles from my US Airways card, but I have been looking for a closer alternative because the Walmart is a little out of the way for me. 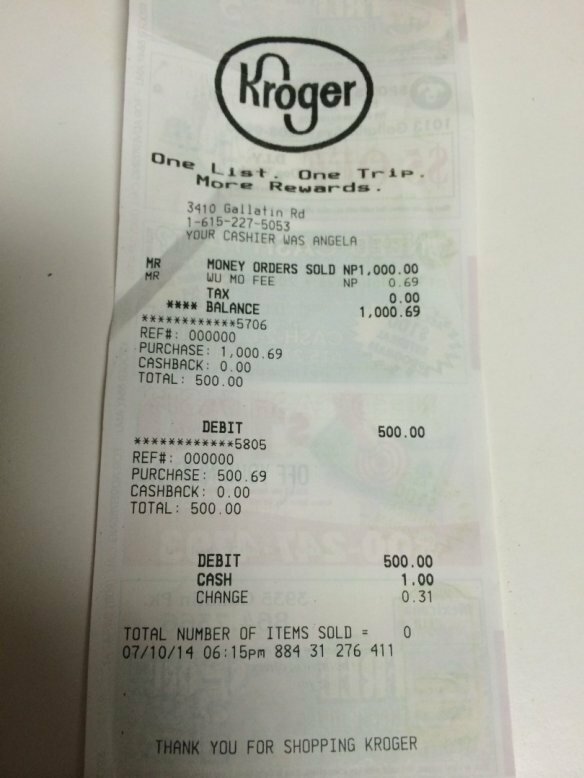 I just recently found that you can also buy money orders at Kroger grocery stores! This means that I have another place to take my Simon Mall Gift cards, and the gift cards from offers like the $15 free from Bank of America and Kmart offer and $20 free and 2000 miles from Staples offer that I wrote about this week. This is a key part of my plan on How to Spend Money without Spending Money for almost Free Miles! Start out at the Guest Care and Money Services Desk. My location was selling them for only $0.69! 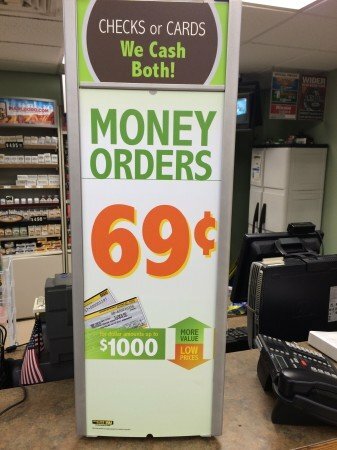 Tell the cashier you need a $1000 money order (or whatever amount) and they will ring up the total. You can do multiple money orders at one time but if you get $3,000 or more they have to fill out a form with your ID. 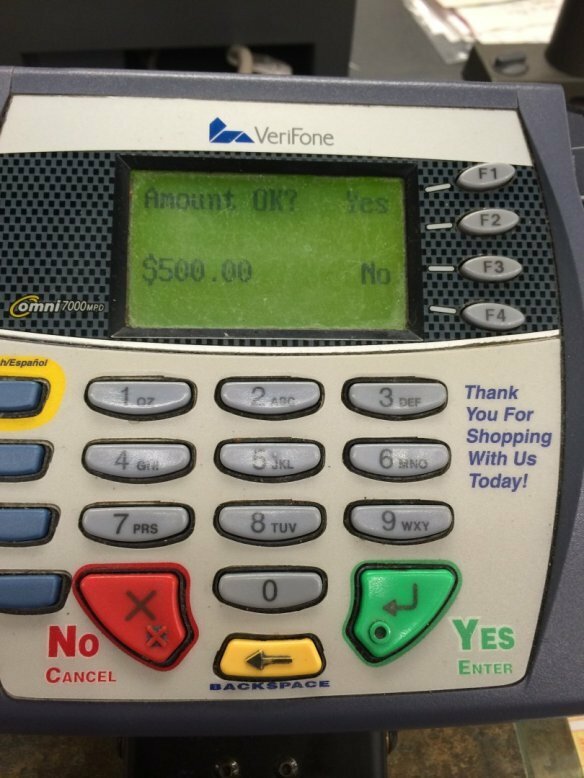 Tell them you are paying by debit card and tell them you want to split the transaction and put $500 on your debit card (or whatever amount your gift cards are for). Remember that you need to have set the PIN for the gift cards before you use them! Then swipe your card on the credit card terminal that looks like this. Confirm the amount on the screen. 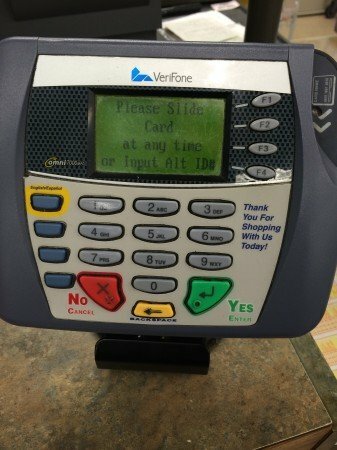 Then enter your PIN. Repeat this as many times as necessary until you have a zero balance. I typically use up all of my gift cards completely and then pay cash for the balance (which is just the money order fees) And you are done! You can then take this money order and deposit it in your bank account. Since there are a bunch of Kroger stores in Nashville where I am currently visiting, having another option besides Walmart to buy money orders and liquidate gift cards is great. Do you know any other locations where you can use gift cards with a PIN to buy money orders? As always, reply with any questions and follow me on Google+, Facebook, Twitter and Instagram to make sure you don’t miss any great info! And don’t forget to share this article with anyone who might be interested! 400-2000 Free Points this week with Staples. You really can’t beat deals where you get paid to take points. When these come up I like to go big like when I made 43,000 points in one week at Officemax. This is another one of those deals, but just a smaller one. This offer is good though July 19, 2014. Any miles earning credit card such as the US Airways Card. To get the maximum of 2070, you will need a card that gives you 5% at Staples such as the Chase Ink Bold or Chase Ink Plus. 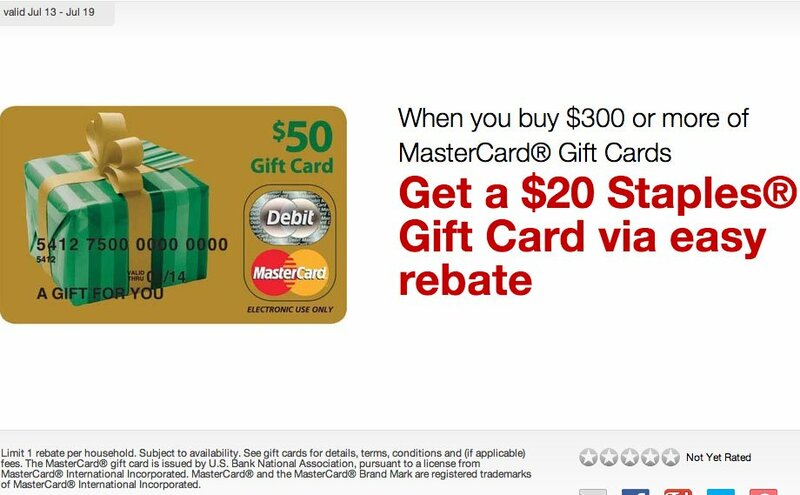 Staples has a deal this week where when you buy $300 worth of gift cards you will get a $20 Staples gift card in the mail via their easy rebate program (which is the easiest online only rebate program and only takes about 3 minutes to complete when you get home). 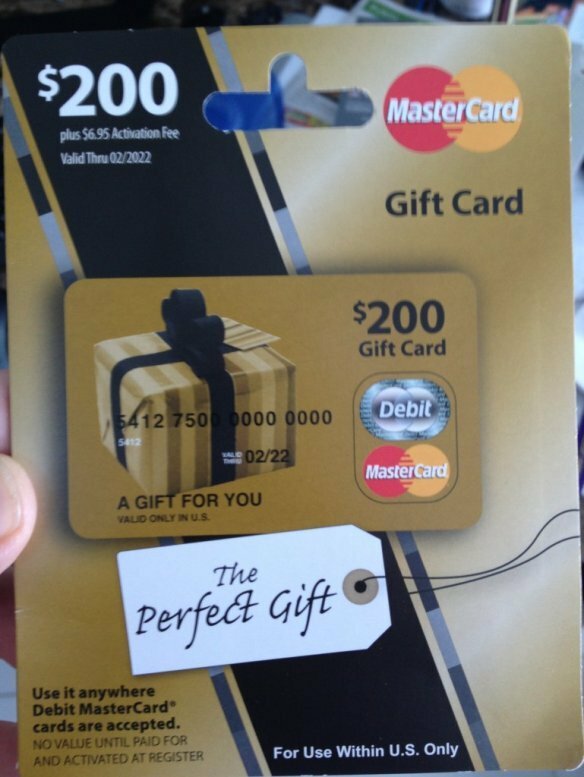 Go to your local staples and find two $200 Mastercard gift cards. You might call ahead to make sure they have them in stock before you drive there since not all stores carry the $200 variety and the Visa gift cards won’t work for this promotion. They will look like this (they are the same cards we bought in the recent $15 free money deal at Kmart). By buying two $200 gift cards each with a $6.95 fee, you will minimize the % of the fee per dollar. This means that your total cost will be $413.90 for two gift cards. If you use the US Airways card, you will get 413 US Airways miles for this purchase. If you use your Chase Ink Bold card, you will get 2070 Ultimate Rewards points since they give you 5 miles per dollar at office supply stores like Staples. Remember you will be getting a $20 Staples gift card back in the mail in a few weeks which will mean you got $400 in gift cards for $413.90 – $20 – $393.90! 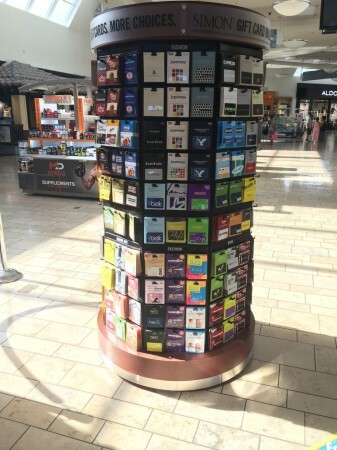 What to do with the gift cards? 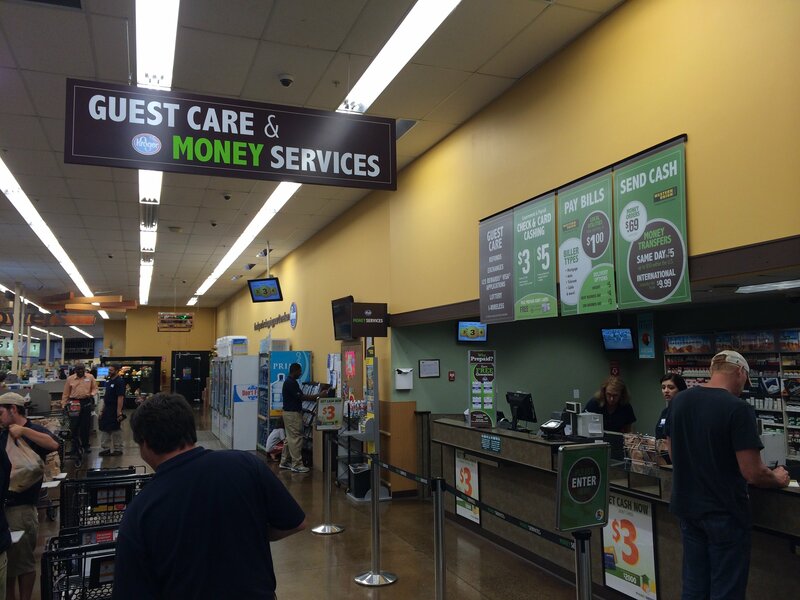 Get a money order at Walmart which you can deposit into your bank account. Use the Kiosk at Walmart to deposit them to your Bluebird account then do an online bill pay to pay off the credit card you used. Go to a register at Walmart and deposit them to your Bluebird account then do on online bill pay to pay off the credit card you used. You really can’t go wrong with this deal. Getting paid to take points is one of the things I love about the points and miles game! Enjoy! Author John ButlerPosted on July 16, 2014 July 16, 2014 Categories Manufactured SpendLeave a comment on 400-2000 Free Points this week with Staples. We realize that not every deal can be 43,000 Ultimate Rewards points in a week. Sometimes, you come across a little deal that is just free money. This is one of those deals. It probably isn’t worth a special trip, but if you are running to Simon Malls to buy some gift cards so you can Get Miles for Paying your Rent or Mortgage and their happens to be a KMart on the way, why not pick up an extra $15? If you have a Bank of America credit card or debit card, they have a section on their online banking under Cash Back Deals called BankAmeriDeals. 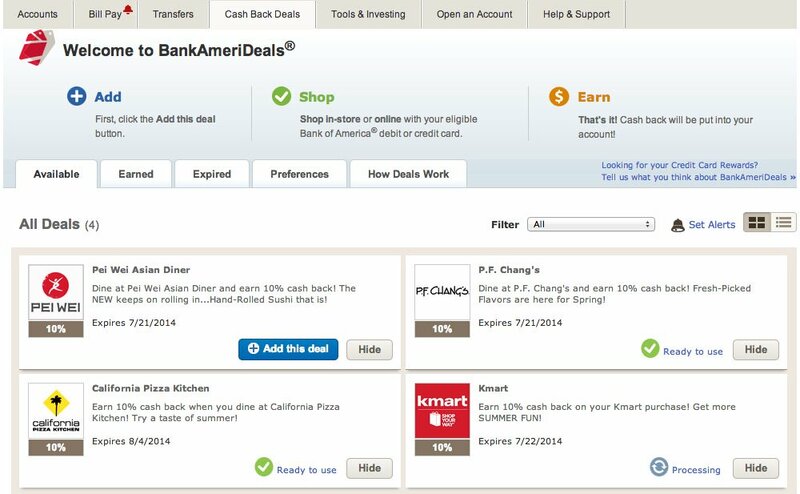 Deals come and go, but the one we are interested in is the one for 10% cash back at KMart through 7/22/14. When I click on the logo, it gives you more details. All you have to do is go to KMart and buy $150 worth of anything and Bank of America will give you $15 back as a credit on your account. When I went there I found a big gift card rack with Amazon gift cards, restaurant gift cards, phone gift cards, and most importantly, Visa and Mastercard gift cards! I grabbed a $200 Mastercard which had a $6.95 fee that looked like this. I took it to the cashier and told them I wanted to put $150 on my Bank of America card then the remaining balance on my Chase Sapphire Preferred card. This way I will max out the $15 total benefit with my Bank of America card and get Ultimate Rewards points for the balance ($56.95). When I opened the package I instantly saw what I was looking for, the PIN code. I was able to take this card along with some others and buy a money order at the Walmart money center. I then was able to deposit that money order in my checking account which I used to pay off the credit card bill. At the end of the day, I spent $206.95 and got a $15 credit. So after the fee this comes to $8.05 in profit, but I also got 1% cashback on the BoA charge (so $1.50) plus 56 UR points. Not a home run by any means, but $8 is enough for lunch at a lot of places. Who says there is no such thing as a free lunch! 🙂 Note if I wanted, I could have bought a $150 Amazon gift card which has no fees and gotten the full $15 in cash back. Since I didn’t have any Amazon purchases planned, I preferred something I could easily convert to cash. What do you think? Is this worth your time if you are already out and about? As always, reply with any questions and follow me on Google+, Facebook, Twitter and Instagram to make sure you don’t miss any great info! This news might help people who have read our article on How to Get Frequent Flyer Miles for paying your Rent or Mortgage. The free Bluebird card now allows you to load $2500 a day via gift cards with PIN at Walmart Kiosks or Walmart Registers. Previously, it was $1000 per day. The monthly load limits of $5000 are still in place. The online methods of loading using a true debit card (Gift cards with PIN capability won’t work) have also been increased from $100 a day to $200 a day. For people who have rent or mortgage (or other bills such as student loans or car payments) that are over $1000 but under $2500 this will mean you can take just one trip to the mall and then to Walmart. As always, reply with any questions and follow me on Google+, Facebook, Twitter and Instagram to make sure you don’t miss any great info! 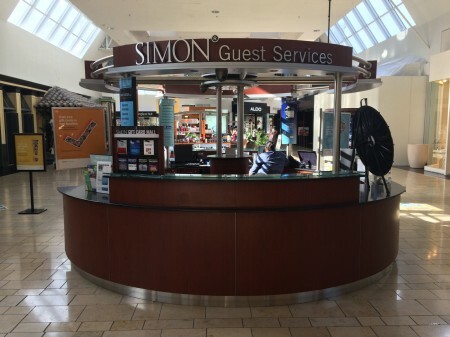 Is the Simon Mall gift card kiosk Nirvana? Maybe! 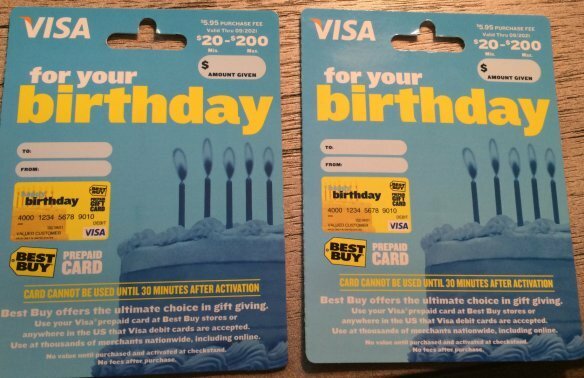 Now that I can buy money orders with gift cards at Walmart, I wanted to find the cheapest spots to buy Visa gift cards. What I have found with help from Flyertalk is Simon Malls! 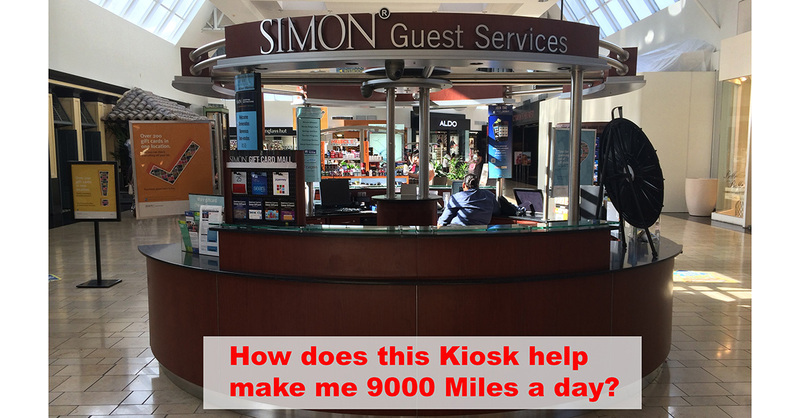 Your local Simon Mall has a kiosk that sells Visa gift cards with an up to $500 balance with a $2.95 fee. Go to www.simon.com to find the closest mall to you but call to confirm they sell the Visa gift cards before you make the trip. The kiosk looks like this:They will also probably have another rack of gift cards that looks like this:The cards that you want are the blue and white visa gift cards that they sell behind the counter. You can get them in denominations up to $500 and there is a $2.95 fee. You should always get the $500 ones so you decrease the % cost of the fee you pay. 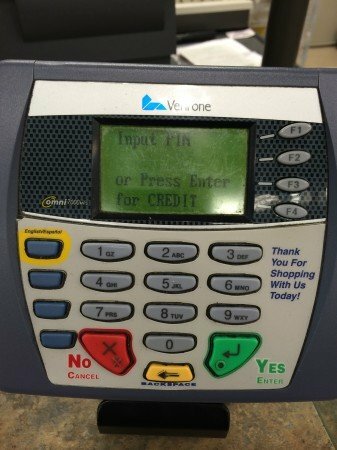 Once you have the card, if you want to use it to buy money orders at Walmart or load your Bluebird account using the kiosk, you will need to set the PIN code. 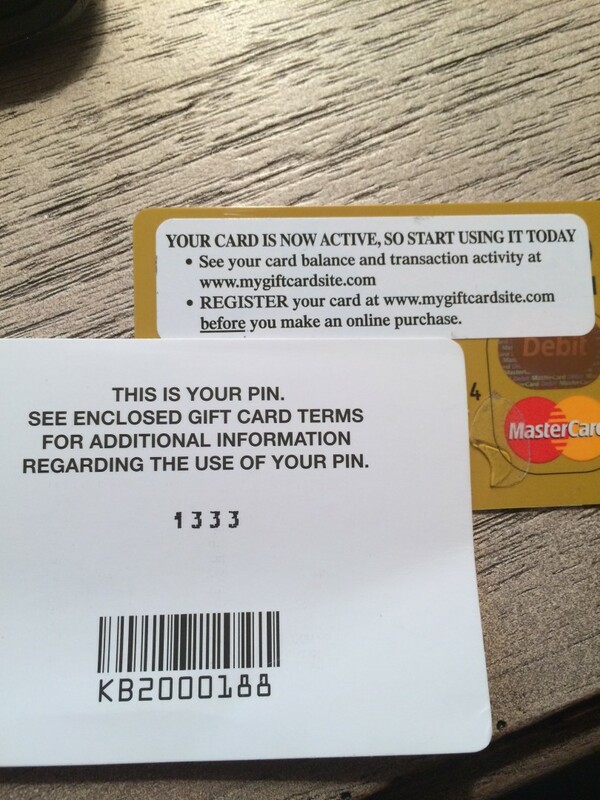 To set the PIN code, you call the number on the back of the card which is currently 1-866-300-9401. Once you get the process down it can be quite quick and you don’t have to wait for the whole prompt to play before entering the next option. At this point you have a gift card with a PIN set that can be used for any debit transactions (but not for cash back or ATM usage). This works perfectly for Bluebird loads or getting money orders. I have found that if I buy more than $1000 worth in a day, they have to fill out a form and have to have a higher up verify that the credit card matches your ID. Since I typically buy $3000 at a time (since $3000 is the most you can buy in money orders at a single Walmart per day), they fill this form out often. If they ask what you are doing with the gift cards you can just say you are using them for gifts or you could just say you are doing it to get frequent flyer miles. For those who really want to maximize your miles, what I like to do is combine one of these $500 gift cards I buy with my US Airways card with three $200 gift cards I buy from OfficeMax or Staples using my Chase Ink Bold card. I then get money orders at Walmart by paying the $0.70 money order fee in cash, then using a $500 gift card in full, two $200 gift cards in full, and use $100 of the last $200 gift card. Then I do the same thing again, but this time use the remaining $100 for the last $100. Doing it this way, I earn 500 US Airways miles plus 2500 Ultimate Reward points for each $1000 money order. Since I typically do $3000 per day, that means I can earn 1500 US Airways Miles and 7500 UR points every day if I didn’t mind running around a little. I probably wouldn’t recommend doing the same cards every day, but if you buy using different cards and different Simon malls then it will be less likely to attract unwanted attention. We aren’t doing anything illegal but a small number of people buying gift cards do so with stolen credit cards so when you buy a lot, everyone involved is very careful. I know this is a lot of information but feel free to comment with any questions and follow me on Google+, Facebook, Twitter and Instagram! 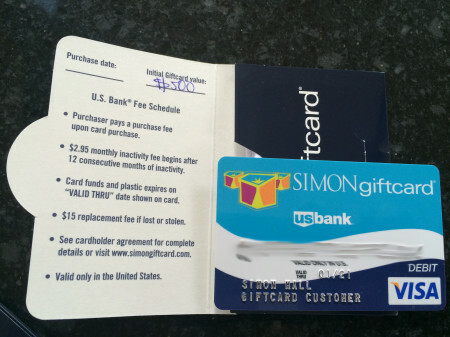 Author John ButlerPosted on June 10, 2014 July 23, 2014 Categories Manufactured Spend, Prepaid Cards8 Comments on Is the Simon Mall gift card kiosk Nirvana? Maybe!